Black and white pendant chain necklace. 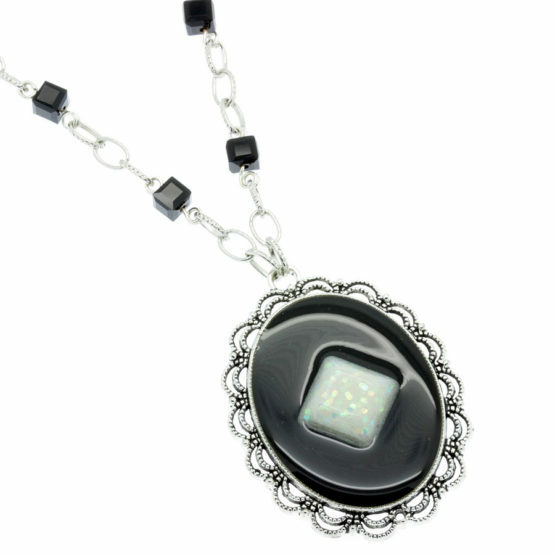 Chain necklace with a black and white pendant in brilliant resin. Made with silver tone chain with textured links where some glass beads were applied in cube-shaped, black. The pendant is created in resin in black and pearl shades with sparkles on a silver tone metal base with textured contour. Bright blue resin pendant chain necklace. Chain necklace with a bright blue pendant made with resin. Made with silver tone chain with long links. 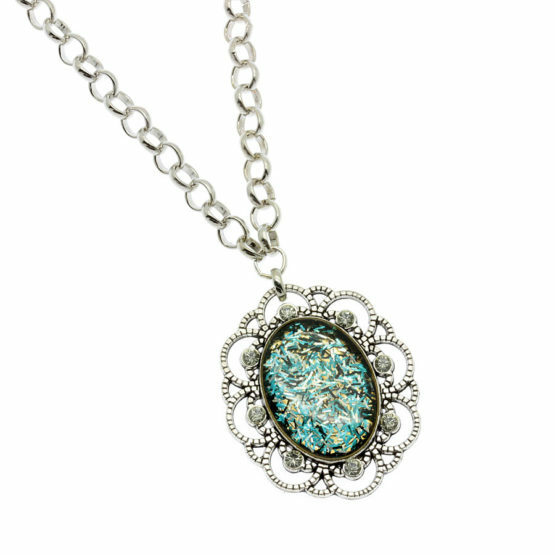 The pendant has a silver tone metal base crafted with tiny shiny crystals in the outline. The inside is fully created in bright resin in shades of crystal blue. Bright red resin heart chain necklace. 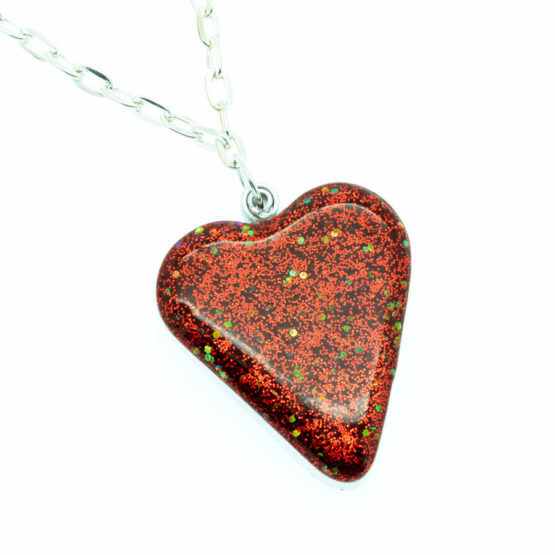 Chain necklace with bright red heart in resin. Made with bright silver plated chain. The heart-shaped pendant was totally created in resin with silver tone metal ribbon trim. Bright star necklace. Chain necklace with a shiny pearl star. Made with thin silver tone chain and bicone glass beads in mirrored black tone and cube beads in mirrored crystal tone. The pendant is fully created in bright resin in pearl and black shades. 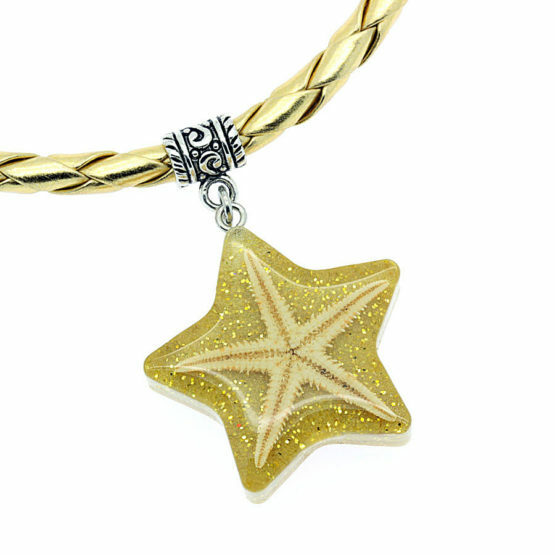 Leather necklace with natural starfish embedded in bright resin pendant. Made with braided white leather. The pendant is totally created in bright resin with sand color of the beach. A natural star of the sea was embedded into it. Shiny silver tone chain necklace with a brown pendant in resin. Made with bright silver tone chain. The pendant is a square and has been totally created in shimmering brown resin. Necklace with a conch in resin. 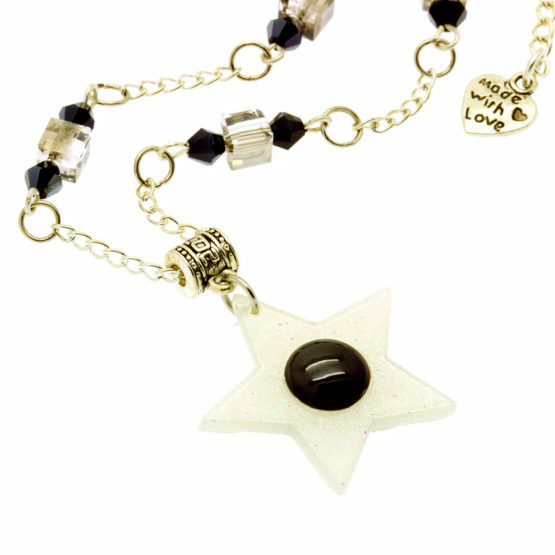 Chain necklace with a starry pendant with a conch inlaid in resin. Made with silver plated chain. 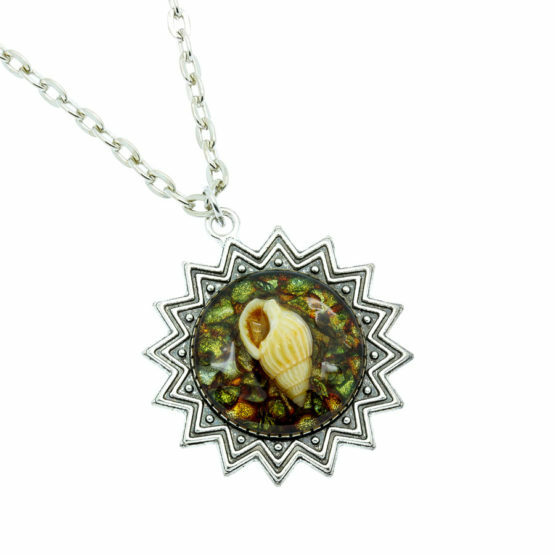 The pendant has a starry silver tone metallic base textured in which was embedded a natural conch in bright resin, mirror effect, with brown and green colour. 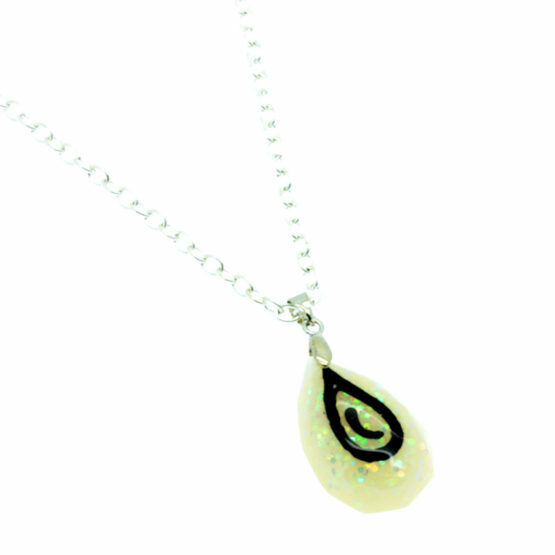 Shiny silver plated tone chain necklace with a drop pendant in beige resin with black handmade drawing. Made with bright silver tone chain. The pendant is drop-shaped and has been fully created in bright beige resin with glitter. Chain necklace with green leaf pendant. Made with silver tone chain with acrylic beads in two shades of green. 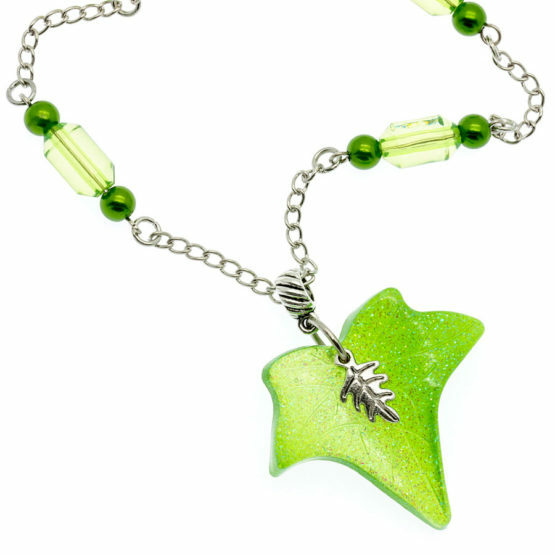 The pendant is totally created in bright resin also in bright green, in the shape of a tree leaf. A small metallic silver tone pendant in the shape of a tree leaf is also placed on the top of the resin pendant. 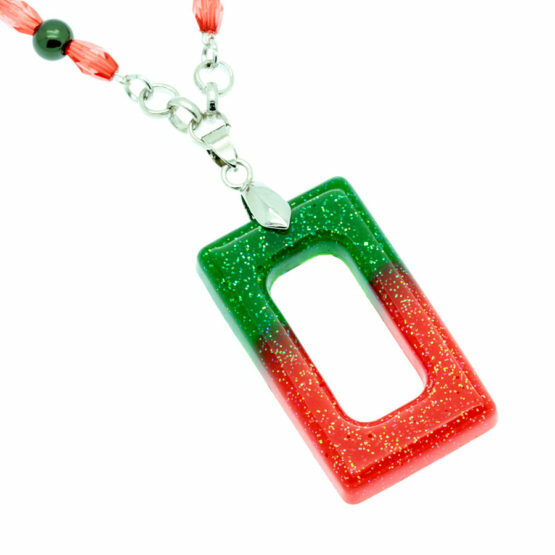 Chain necklace with red and green rectangle. Made with silver tone chain with red and green acrylic beads. 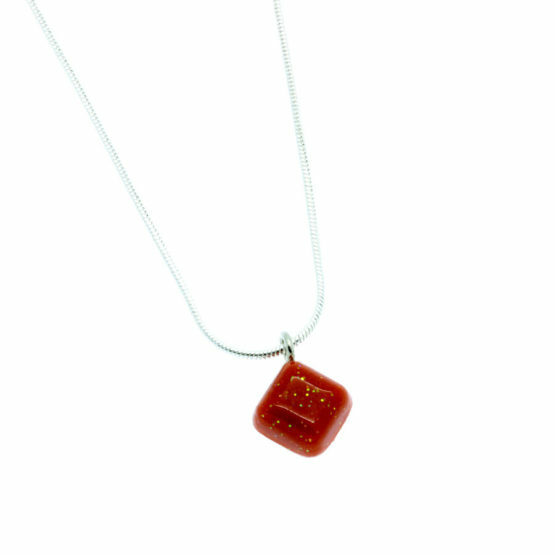 The pendant is totally created in bright resin also in red and green with brilliance in the shape of a rectangle. 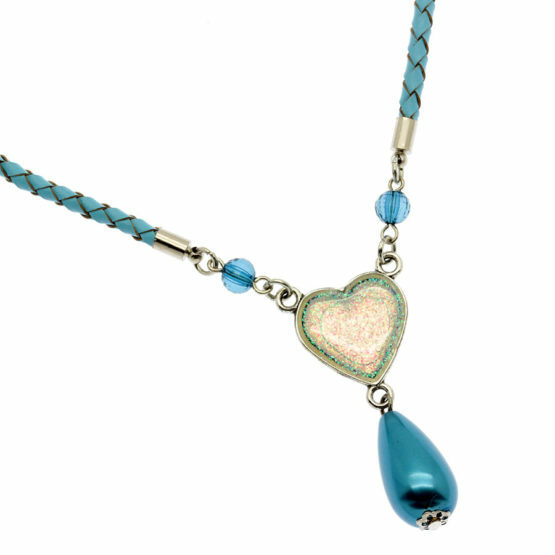 Leather necklace with silver tone metal base pendant in heart shape filled with shiny resin and a blue drop. Made with light blue plaited leather. The pendant was created with shiny resin with sparkling water effect where a blue drop was hung. Necklace with blue resin heart pendant. Shiny silver tone chain necklace with a blue heart pendant in resin. Made with bright silver tone chain. 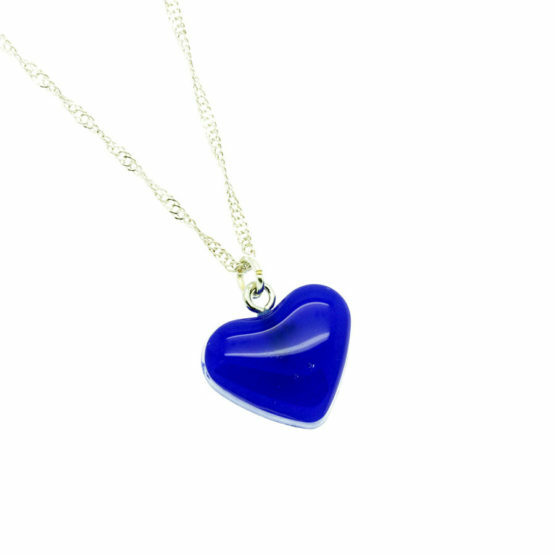 The pendant is a heart totaly created in bright resin in blue.